Alice Guy makes a daring shift from comedy to drama in this short, which may be one of the first “revenge movies.” It shows the complexity that audiences were beginning to expect as the Nickelodeon era progressed, but also tests the limits of that complexity in a short format. The movie opens on the front yard of a typical rural household. 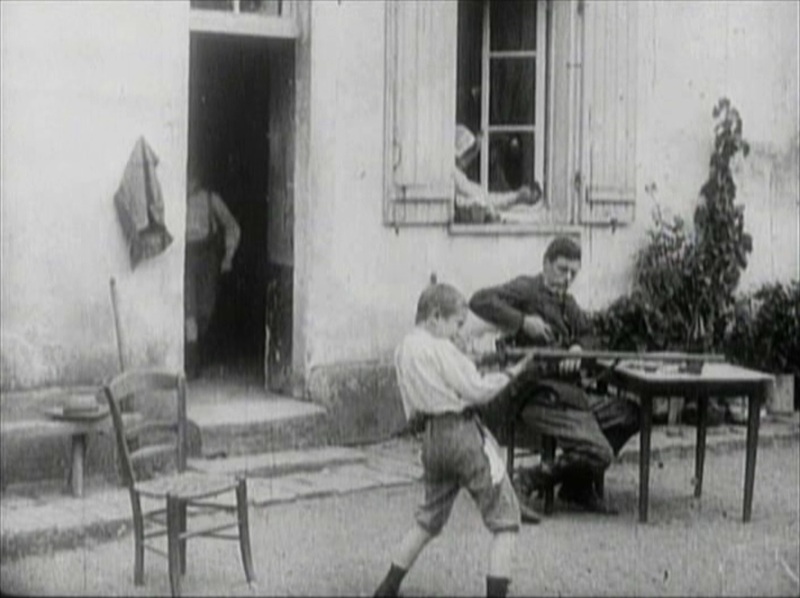 The father sits at a table with a glass of wine and a small child plays with his (the father’s) rifle. Then the elder son, perhaps nine or ten, takes the gun away from him and cleans it for his father. The father finishes up his wine, totally unconcerned about either child’s handling the weapon, and then prepares for his day at work. Finally, he takes the rifle, and as he does the elder son asks if he can come along. The man decides he is too young and tells him to stay home, but the boy follows him secretly. Next, we see two men hunting in the woods, dressed in ragged clothes, clearly local poachers. Each shoots his gun and they run over to collect their game. 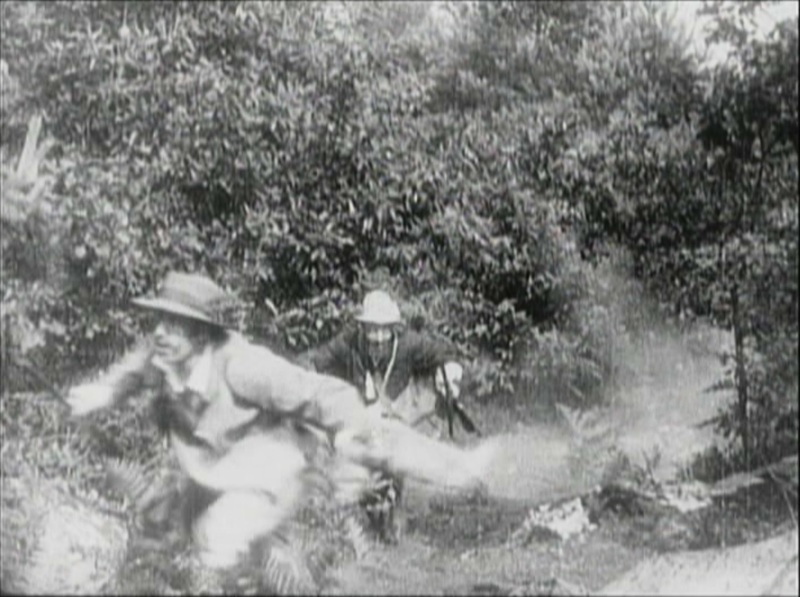 Now the man from the previous scene (who is the game-keeper) comes running out of the brush, chasing them offscreen. 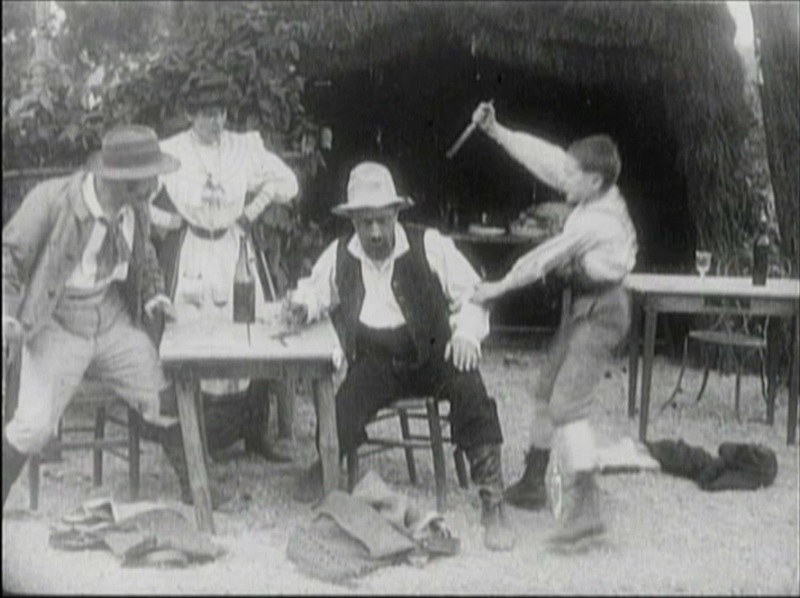 For a little while, the movie follows a fairly standard chase format, where the pursued run across the screen, followed by their pursuer (and then the son, who in one instance picks up the gun his father has dropped but leaves his hat). But, then, the men cross a ravine which is traversed by a plank, and the second one turns the plank, allowing it to fall into the ravine. When the father runs into the shot, he is looking at the poachers, not at his feet, and he also falls into the chasm. His son stops in time, having seen his father plunge out of sight. Now, the tone of the movie changes. What had seemed a fairly light-hearted chase through the woods has become tragic. The boy runs home and tells his mother and little brother what has happened. While they are grieving together, the poachers, still lost in the woods, stumble upon the hut of the grieving family. Only the eldest son sees (the others are covering their faces and weeping), and he once again picks up the gun and gives chase. The poachers, however, think they have made a clean getaway and return to town, where they stop in a café and order wine. Fairly soon they begin to bicker among themselves. The son hides beneath a table until they are fully engaged with one another and then springs out with a knife, attempting to stab one of them. He is unsuccessful but the ruckus convinces the waitress to summon the police. They hold one of the poachers and run, with the boy, in pursuit of the other. We get another short chase sequence, but soon the poacher comes to that same ravine from the other side. This time, the boy shoves him, and he falls to his doom. The police quickly arrive and shake his hand. This movie is a bit startling, and I suspect that’s at least partly intentional. The simple set up and chase at the beginning makes you expect a comedy, or at most a fairly conventional action picture, and the sudden death of the father in the middle leaves you groping for a resolution. Up until the end, I kept expecting him to come back, having somehow survived the fall. It just seemed like that kind of a movie. But, it’s not. In the end, the boy still has no father and the death of the second poacher seems a rather extreme punishment for running away from a game keeper. Admittedly he caused the man’s death, but all they really meant to do, so far as I could see, was inhibit his pursuit. That the police would congratulate this seems all the more chilling. Still, I have to assume that this, as well as the child’s handling of a gun, was taken to be appropriate in context at the time. That context isn’t just the difference in attitude between today and 1906, but also the standards of a rural community, living we assume in a traditional manner where the eldest son has certain rights and responsibilities, even at quite a young age. I won’t say that I liked this film as much as some of the fun comedies I’ve been reviewing lately, but it did force me to think a bit. It’s also reasonably sophisticated for the time – where the chase scenes seem set up to be formulaic, Guy throws narrative surprises at us and keeps the movie from falling into obvious ruts.